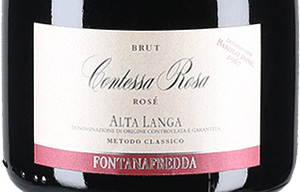 Contessa Rosa Rosé by Fontanafredda is a Alta Langa that is born in vineyards located in the Langhe albese and astigiana. Obtained from Pinot Nero and Chardonnay grapes, picked and selected only by hand. Classic method, it is pale pink in color, with onion peel reflections. Excellent as an aperitif, classy throughout the meal. 'Giugiaro Design' gift set with 2 glasses included. THE WINE Contessa Rosa Rosé by Fontanafredda is a Alta Langa grown in vineyards located in the Langhe Albese and Asti, in the heart of Piedmont. Obtained from Pinot Nero and Chardonnay grapes, picked and selected only by hand at the beginning of September. Classic method, it is pale pink in color, with onion peel reflections. Excellent as an aperitif and classy throughout the meal. 'Giugiaro Design' gift set with 2 glasses included. THE COMPANY Fontanafredda is a historic winery immersed in the fascinating hills of the Langhe, born from the estates of Roggeri Giacomo in Serralunga d'Alba, registered in the private patrimony of Vittorio Emanuele II, King of Sardinia, in 1858. However, Emanuele Guerrieri Conte di Mirafiore, son of the king , starting the business, twenty years later, in 1878, thanks to his strong passion, spirit of initiative and foresight. Today Fontanafredda has about 122 hectares, of which 84 are cultivated in vineyards and divided among the most prestigious municipalities in the Barolo area: Serralunga d'Alba, Barolo and Diano d'Alba. The estate is also formed by the historic cellars, the Villa Reale and a large nature reserve. Today Fontanafredda belongs to the association Vino Libero, a group of 12 wine producers and 1 distillery, united by the intention of developing sustainable agriculture, combined with a continuous research process aimed at preserving nature and minimizing intervention in the vineyard and in the winery: the latest experiments by Fontanafredda are aimed at limiting the use of sulfur dioxide. The winery's vineyards live in a lively and varied ecosystem, the soils are processed with controlled ripening techniques, without the use of chemical fertilizers and herbicides, but only of organic substances. A company that still continues to make the history of Piedmont. Tasting Color: light pink. Bouquet: aromas of orange blossom, pomegranate, chinotto, background of custard. Taste: fine and persistent, acidity balanced with the sweet note, mineral and sapid sensation with citrus aftertaste. Contessa Rosa Rosé by Fontanafredda is a Alta Langa grown in vineyards located in the Langhe Albese and Asti, in the heart of Piedmont. Obtained from Pinot Nero and Chardonnay grapes, picked and selected only by hand at the beginning of September. Classic method, it is pale pink in color, with onion peel reflections. Excellent as an aperitif and classy throughout the meal. 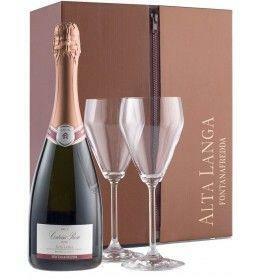 'Giugiaro Design' gift set with 2 glasses included. Fontanafredda is a historic winery immersed in the fascinating hills of the Langhe, born from the estates of Roggeri Giacomo in Serralunga d'Alba, registered in the private patrimony of Vittorio Emanuele II, King of Sardinia, in 1858. However, Emanuele Guerrieri Conte di Mirafiore, son of the king , starting the business, twenty years later, in 1878, thanks to his strong passion, spirit of initiative and foresight. Today Fontanafredda has about 122 hectares, of which 84 are cultivated in vineyards and divided among the most prestigious municipalities in the Barolo area: Serralunga d'Alba, Barolo and Diano d'Alba. The estate is also formed by the historic cellars, the Villa Reale and a large nature reserve. Today Fontanafredda belongs to the association Vino Libero, a group of 12 wine producers and 1 distillery, united by the intention of developing sustainable agriculture, combined with a continuous research process aimed at preserving nature and minimizing intervention in the vineyard and in the winery: the latest experiments by Fontanafredda are aimed at limiting the use of sulfur dioxide. The winery's vineyards live in a lively and varied ecosystem, the soils are processed with controlled ripening techniques, without the use of chemical fertilizers and herbicides, but only of organic substances. A company that still continues to make the history of Piedmont.